Animals require consumption of chemical elements and compounds to sustain bodily functions, for skeletal and tissue growth, and to support the reproductive process. The necessary chemical elements and compounds are referred to as nutrients and can be classified into six categories: water, carbohydrates, lipids or fats, proteins, minerals, and vitamins. The objective of feed evaluation is to provide a rapid and economical method to determine the nutrients available (nutritional value) in a feed. For well over 100 years, the proximate analysis system has been used to describe the chemical composition of feeds. Components of proximate analysis are shown in Figure 1. Figure 1. Nutrient concentrations of feed determined from proximate analysis. Nutritional value is determined by nutrient concentration and nutrient digestibility. Proximate analysis is one method used to determine nutrient concentration, although very little information about nutrient digestibility is gained. True nutrient digestibility information is determined using digestion trials, but it is not practical to test digestibility on all feeds. Therefore, previous digestibility information from similar feeds and previous relationships between digestibility and some nutrient concentration measures is commonly used to estimate digestibility. Table 1 contains average nutrient concentration values for numerous feeds that are common in Oklahoma. Values in the table represent averages from numerous different sources, such as the National Research Council’s Nutrient Requirements of Beef and Dairy Cattle publications, commercial laboratories, research trials, and other publications. Beef magazine also publishes a Feed Composition Guide that is updated annually. The 2008 guide can be found at http://beefmagazine.com/images/2008_feed_comp_cattle_sheep.html. Producers must recognize that values published in any table are merely typical averages and that variation among grains, oilseeds, byproducts, and in particular forages and roughages can be extreme. Furthermore, various processing methods may also alter the digestibility. For this reason, producers are advised to have their feeds and forages tested for nutrient composition by commercial laboratories. To improve quality control and standardization among commercial laboratories, the National Forage Testing Association (NFTA), found at http://www.foragetesting.org, provides a unique certification service. At this Web site, one can also view the NFTA’s recommendations for laboratory procedures and equations for use in predicting energy availability for different forage types. One of the primary decisions you will have to make is to have a Near Infrared Reflectance Spectrophotometer (NIRS) or wet chemistry. Generally NIRS is less costly as it estimates wet chemistry values by bouncing light through samples. With this type of analysis, the lab should have a list of types of feed samples that they can analyze by this method. For instance, most labs can perform quality NIRS analysis on alfalfa samples. For samples that the lab does not specify they have NIRS capabilities, you should consider having wet chemistry analysis completed. Dry matter (DM) expresses the proportion of the feed that is not water. The moisture concentration is determined by weighing the feed sample soon after the sample has been collected. Next, the sample is placed in a drying oven until all of the water has been evaporated. Finally, the dried sample is weighed again and the DM content is calculated by difference. Other than physical characteristics of the feed, moisture content has little to no bearing on the availability of nutrients within that feed. Dry matter is an extremely variable component among and within types of feeds. Fresh forages, silages and wet byproduct feeds are likely to vary the most in DM content. Some silages and byproduct feeds contain as little as 25 percent DM (75 percent moisture). A good rule of thumb is that dry feeds should contain no more than about 12 percent moisture for safe storage in overhead bins. The original proximate analysis system separated carbohydrates into crude fiber and nitrogen free extract (NFE) fractions. The crude fiber portion of the feedstuff was intended to represent the indigestible fiber fraction and NFE was supposed to represent the more readily digestible carbohydrates, such as sugars and starches. However, it was soon discovered that this system had serious limitations, particularly for fibrous feeds like forages. Because of the wide variation in chemical analyses for crude fiber and NFE, a new system called the detergent fiber system was developed, which better reflects true carbohydrate digestibility in ruminants (Figure 2). The neutral detergent solubles (NDS) fraction is comprised of cell contents that are nearly 100% digestible. The neutral detergent insoluble fiber (NDF) fraction is made up of primarily cell wall tissue, which consists of hemicellulose, cellulose, and lignin. The NDF fraction also contains small amounts of silica and fiber-bound or heat-damaged protein. The NDF fraction of feeds and forages is quite variable in digestibility. Using an acid solution, the NDF residue can be further separated into acid detergent solubles (ADS; primarily hemicellulose) and acid detergent insoluble fiber (Figure 3). The acid detergent insoluble fiber fraction contains cellulose, which has variable digestibility, and lignin, which is nearly indigestible. With purchased feeds that come with a feed tag, crude fiber is the only fiber analysis that is required. Unfortunately, this provides little assistance in determining the nutrient value or digestibility of the feed. However, it may be possible for your feed representative to provide you with NDF and ADF values. NDF concentration is highly inversely related to the amount of the feed the cattle will eat. Because digestibility of fiber is proportional to the amount of lignin in the plant material, ADF is inversely related to the digestibility of feed ingredients. This relationship explains why some forages and feeds contain high NDF concentrations, but remain high in digestibility, while others may contain moderate or low NDF concentrations, yet are low in digestible energy. Figure 2. The detergent fiber system. Figure 3. Fiber fractions in the detergent fiber system. 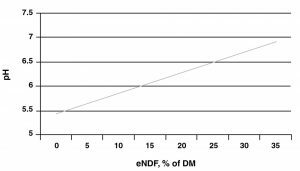 The effective NDF (eNDF) value shown in Table 1 is a measure of the feed NDF that is effective in stimulating rumen motility or churning. The layman term for eNDF is the scratch value of the feed. If the rumen stops churning, acidic gasses build up causing the pH to drop. The result is bloat, acidosis, and/or founder, as well as reduced diet digestibility. 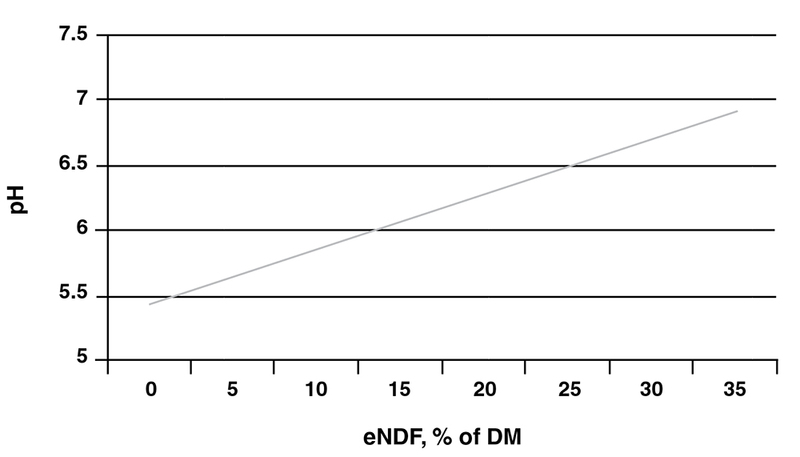 The table expresses eNDF as a percentage of NDF. This value is determined by several factors including particle size, density, hydration, and degree of lignification. To maintain optimal forage digestion, the diet should contain a minimum of 20 percent eNDF on a DM basis. Figure 4. The relationship of effective NDF and rumen pH. Protein values in the Table 1 reflect CP, which is simply nitrogen concentration multiplied by 6.25. The degradable intake protein (DIP) column is an estimate of the proportion of the crude protein that is actually degradable in the rumen and is expressed as a percentage of CP. Undegradable protein (percent of CP) can be calculated by subtracting the DIP value from one hundred. Feed energy values are expressed on a DM basis as percent total digestible nutrients (TDN), net energy for maintenance (NEm), and net energy for gain (NEg) units (mega calories per 100 lbs of feed). TDN is determined by carrying out a digestion trial and summing the digestible protein and carbohydrates plus 2.25 times digestible ether extract. Ether extract (EE) is the fat or lipid portion of the feed. The net energy system is generally thought to be more precise in estimating the energy value of feeds, particularly roughages. The net energy of feed is the portion that is available to the animal for maintenance or various productive purposes. The portion used for maintenance (NEm) is used for muscular work, maintenance and repair of tissues, maintaining a stable body temperature, and other body functions. Most of this energy that was digested will leave the animal’s body as heat. The energy that is used for productive purposes (NEg) may be recovered as growth through retaining energy in tissues. Energy for productive purposes is less efficient than energy used for maintenance. Milk production is unique because its energy efficiency is similar to maintenance uses. Minerals that are needed by animals in larger quantities are referred to as macro minerals. These minerals are shown in Table 1 and feed concentration is expressed on a percent of DM basis. Minerals that are needed by animals in much smaller quantities are referred to as micro minerals and feed concentration is expressed in parts per million (ppm) in the table. To convert ppm to percent, simply move the decimal place four places to the left. For example, if a feed contained 12 ppm copper, the copper concentration expressed as a percentage would be 0.0012 percent. Producers have to ensure that their animals’ diets include the proper balance of the six essential nutrients in a physical form that maintains digestive system health and function. To accomplish this, producers must have good knowledge of available feed nutrient composition, physical and digestive characteristics, and the animal’s nutrient requirements. Nutrient concentration and digestibility data can be determined by using digestion trials or measuring chemical composition and applying this information to estimate digestibility. It is imperative that producers recognize that values published in any table are merely averages and that variation among feed commodities, oilseeds, and in particular forages and roughages can be extreme. For this reason, producers are advised to have their feeds and forages tested for nutrient composition by commercial laboratories. NRC. (2000) Nutrient Requirements of Beef Cattle (7th Edition). National Academy Press, Washington, DC. Table 1. Typical composition of feeds and forages. a Effective neutral detergent insoluble fiber.